The Confucius Institute at New York's Pace University marked its two-year anniversary on April 29 with a public event to introduce Chinese culture to teachers, students and local residents. Teachers, students and local residents enjoy traditional Chinese cuisines in the Confucius Institute at New York's Pace University. 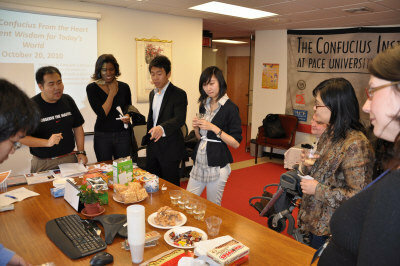 The event featured tours of the Confucius Institute, hands-on workshops and cultural activities. Participants were able to learn Chinese calligraphy on-site, practice Chinese martial art and qigong (a system of deep breathing exercises). The Chinese Corner, a weekly Chinese language and cultural gathering, attracted lots of non-native Chinese speakers to chat in and practice Chinese in a welcoming and friendly environment and enjoy traditional Chinese cuisines. New York Council Member Vincent Gentile is taking a Chinese course at the Confucius Institute. "New York City is a cosmopolitan city and it is so great to have the Confucius Institute here. We have the ability to learn Chinese here and understand each other's cultures better," he said. Dr. Zhou Yanyu, associate director of the institute, said that the Confucius Institute serves as a bridge to connect the East and the West. "We hope to enable Chinese culture and language to reach out to more communities in New York to facilitate cross-cultural understanding between people in the United States and China," Zhou said. Founded in May 2009, the Confucius Institute at Pace University is the first university-based institute of its kind in New York, aiming at integrating pedagogical, scholarly and professional expertise to promote U.S.-China cultural exchanges.